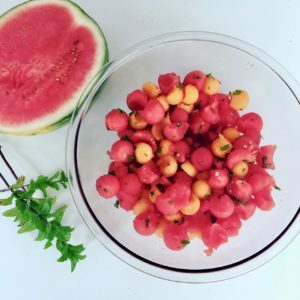 Wonderful and simple summer time salad, with a twist! Mint is an amazing herb that is both delicious and incredibly nutritious. Option 1: cut melons in half and remove seeds. Use a melon baller to remove small balls of melon for the salad. Option 2: Remove rind of watermelon. Cut melon into flat, almost octagon sections (like a 1 inch thick stop sign) and cut melon into even squares. Mix melon together in a bowl. Add chopped mint and mix until evenly distributed. Optional: Garnish with a few whole mint leaves. This salad is full of vitamins (specifically A & C), supports detoxification, and the mint help supports digestion. This is a perfect summer time side salad!